AGER-2, the USS Pueblo. From Wikipedia: USS Pueblo (AGER-2) is a Banner-class Environmental Research Ship, attached to Navy intelligence, which was attacked and captured by North Korean forces on 23 January 1968, in what is known today as the Pueblo incident or alternatively, as the Pueblo crisis. The seizure of the U.S. Navy ship and its 83 crew members, one of whom was killed in the attack, came less than a week after President Lyndon B. Johnson's "State of the Union" address to the United States Congress, just a week before the start of the "Tet Offensive" in South Vietnam during the Vietnam War, and only three days after 31 men of North Korea's "KPA Unit 12" had crossed the Korean Demilitarized Zone (DMZ) and killed 26 South Koreans in an attempt to attack the South Korean "Blue House" (executive mansion) in the capital Seoul. The taking of Pueblo and the abuse and torture of its crew during the subsequent 11-month prisoner drama became a major Cold War incident, raising tensions between the western democracies and the Union of Soviet Socialist Republics and People's Republic of China. North Korea stated that the Pueblo deliberately entered their territorial waters 7.6 miles away from Ryo Island, and the logbook shows that they intruded several times. However, the United States maintains that the vessel was in international waters at the time of the incident and that any purported evidence supplied by North Korea to support its statements was fabricated. Pueblo, still held by North Korea today, officially remains a commissioned vessel of the United States Navy. Since early 2013, the ship has been moored along the Botong River in Pyongyang, and used there as a museum ship. Pueblo is the only ship of the U.S. Navy still on the commissioned roster currently being held captive. AGER-2, the USS Pueblo. From Wikipedia: USS Pueblo (AGER-2) is a Banner-class Environmental Research Ship, attached to Navy intelligence, which was attacked and captured by North Korean forces on 23 January 1968, in what is known today as the Pueblo incident or alternatively, as the Pueblo crisis. The seizure of the U.S. Navy ship and its 83 crew members, one of whom was killed in the attack, came less than a week after President Lyndon B. Johnson’s “State of the Union” address to the United States Congress, just a week before the start of the “Tet Offensive” in South Vietnam during the Vietnam War, and only three days after 31 men of North Korea’s “KPA Unit 12” had crossed the Korean Demilitarized Zone (DMZ) and killed 26 South Koreans in an attempt to attack the South Korean “Blue House” (executive mansion) in the capital Seoul. The taking of Pueblo and the abuse and torture of its crew during the subsequent 11-month prisoner drama became a major Cold War incident, raising tensions between the western democracies and the Union of Soviet Socialist Republics and People’s Republic of China. North Korea stated that the Pueblo deliberately entered their territorial waters 7.6 miles away from Ryo Island, and the logbook shows that they intruded several times. However, the United States maintains that the vessel was in international waters at the time of the incident and that any purported evidence supplied by North Korea to support its statements was fabricated. Pueblo, still held by North Korea today, officially remains a commissioned vessel of the United States Navy. 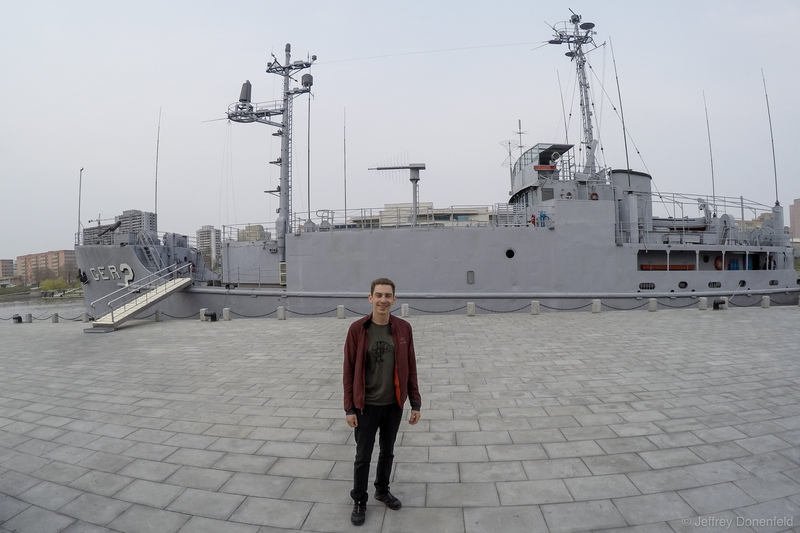 Since early 2013, the ship has been moored along the Botong River in Pyongyang, and used there as a museum ship. Pueblo is the only ship of the U.S. Navy still on the commissioned roster currently being held captive.